Black Feather Games has announced the release of Flood Rush on iOS and Android devices. The game was developed by a group of university students from the United Kingdom, with the goal of raising money to help those suffering from floods throughout Europe. Flood Rush sees players helping a monkey swing across the screen to escape rising flood waters. Flood Rush is a vertical platforming title, which challenges players to swing through the trees as high as they can, avoiding the water below. Players will need to avoid clouds as they climb, which can send wind at the monkey to make him fall, can rain and cause the waters to rise even higher, or send out lightning which stuns the monkey. 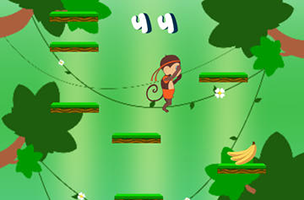 Movement is achieved by tapping and dragging a line towards the top of the screen, to guide the monkey upward. The screen is littered with stationary platforms, and players must aim for these when ‘shooting’ the monkey into the air. The game offers a wraparound screen, so players can send the monkey out of the screen entirely to end up safely on the other side. Flood Rush is available to download for $0.99 on iOS and Android, and is coming soon to Windows Phones. Check back soon to follow the game on AppData, our tracking platform for mobile and social apps and developers.